When it comes down to the hardware used to record these sounds, choosing shouldn’t be tricky. Some of the interfaces mentioned before come bundled with microphones, stands and pop filters. I will discuss some different types and how to choose one for your studio. After all, you want to be able to scream obscenities into the mic right?!? 😀 😛 I know I do! All microphones generate a weak signal by themselves, and need some type of amplifier to boost the signal to a usable frequency. This is why it’s so important to choose the right Audio Interface (as outlined in the previous section). As stated above, dynamic microphones are best suited for miking amps, drum kits, and recording super loud vocals. The way these work is much simpler than a condenser because they receive sound similar to how our ears do. The sound waves hit a diaphragm inside which vibrates a magnet relative to a coil of wire. This generates an electrical signal which is sent down the output cable. In the same way, sound strikes our eardrums and travels to nerve endings which produce a signal our brain interprets as sound. For more information on this process, check out: What is a cardioid capsule? 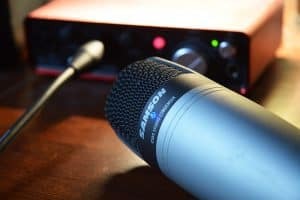 They differ from condenser mics in that they don’t need phantom power, and are much more durable. They also don’t pick up much sound outside of the immediate vicinity, i.e. crowd noise, ambient sound etc. These would do extremely well in a live setting, and have the potential to give your studio sessions a live flavor. They really work well in environments without Acoustic Sound Treatment, as they tend to block out most noise by default. What I went with when starting out, and what you should probably go with is a condenser mic. They have the ability to record vocals and instruments well. They detect sound differently then dynamic microphones, and as a result are more sensitive. Both receive sound through a diaphragm, but when a condenser vibrates it generates a signal (an electric charge) that is received by an external power source. This could be from a battery or more commonly the phantom power that your audio interface uses. Large diaphragm vs. Small diaphragm. 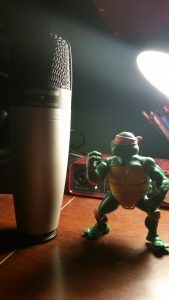 I really won’t go into too much detail here other than you are going to want a mic stand, shock mount, and pop filter for your new toy. Honestly, the inside of a mic is delicate like a flower, and having a pop filter will ensure it lasts a long time. I used to have the On Stage Stands MS7701B Tripod Boom Microphone Stand stand for years in my studio and it served me very well. It is fully adjustable and proved to be extremely versatile when I was recording vocals. I ended up selling it for something more portable and convenient: The Pro Line MS112 Desk Boom Mic Stand. Stu, Great website here. I really enjoy your writing style and how down to earth you seem. If I ever want to start up a home studio I know which site to visit first. Keep it up! Hey, I loved your website, easy to read. Currently I am using an EV N/D67a. I tried it out in the music store. So far, it is fine for both voice and flute. Thanks, enjoy reading about any updates you might have. Thanks so much Eiress! I will have to check out that piece of equipment. i’m assuming it’s a mic? It’s great to hear what others are using!! Yes please keep checking back, I’m vigorously building it out and it will be growing exponentially in the coming weeks. Stu, I started planning for a home studio only few days back but after reading some of your posts it seems I suddenly know so much. Really like your writing style — clear and concise. Will tell about your blog to lot of my other music loving friends here in India! Thank you so much Mukesh! If you ever need anything, just Contact me..
I’m at a loss there. I assume your line out and line in are set correctly in Audacity?